The Euro fell to its weakest position against the US Dollar since mid-December on Thursday evening, driven lower by another dovish assessment of the Eurozone economy from President of the European Central Bank (ECB), Mario Draghi. peaking following the bank’s latest monetary policy meeting, Draghi stated that incoming data was ‘weaker-than-expected’ and was a reflection of softer external demand, both country- and sector-specific factors. He also stressed that uncertainty was weighing on sentiment and that significant stimulus was still needed. Crucially, Draghi tweaked the rhetoric in his statement on the balance of risks to growth from ‘moving to the downside’ to ‘moved to the downside’. Policymakers at the central bank were unanimous in acknowledging both weaker momentum and the changing balance of risk. Near term data is expected to be ‘weaker than previously anticipated’, with headline inflation projected to decline in the coming months. Draghi also stated that no decision had been taken regarding a new round of TLTROs - the long-term loans provided to banks by the ECB to increase lending activity. 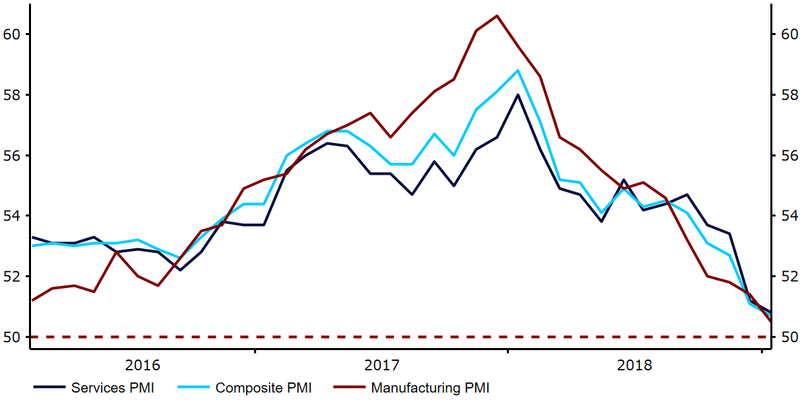 This dovish tone came off the back of another underwhelming set of PMIs out of the Euro-area yesterday morning. The critical composite index sank to just 50.7 this month from 51.1, barely in expansionary territory and its lowest level in 66 months (Figure 1). Such soft data and the cautious tone of recent ECB communications reinforces our view that the first interest rate hike in the bloc since 2011 is unlikely until the first quarter of 2020, at the earliest. The EUR/USD rate is likely to be driven by broader, underlying drivers today. The ongoing US government shutdown ensures that economic news remains very quiet across the pond, with no major data releases to report once again today. Sterling leapt to its strongest position in eleven weeks against the US Dollar yesterday evening following reports that the Democratic Unionist Party (DUP), the Tories coalition partner, could back the Prime Minister in a rerun vote over her Brexit deal. According to the report released on Thursday, the DUP could support May, provided the deal includes a clear time limit to the Northern Irish ‘backstop’. While, it remains to be seen whether May will be offered such a concession by the EU, this is a fairly positive development, particularly given the DUP has voiced a firm opposition to the deal in the past few weeks. Parliament will hold a second vote on the deal on Tuesday. It again looks very unlikely to pass, although there are signs that a handful of Conservative MPs and DUP members could be ready to shift their support in favour of the Prime Minister. The Pound has already gained over 2.5% so far in 2019 on growing optimism that a ‘no deal’ Brexit will be avoided.